Lowdown: Loch and her gang of do good criminals fight to save the world from the ancients’ return. If you were to read my reviews of The Palace Job and The Prophecy Con, the previous two books in this Rogues of the Republic trilogy (?) I only stumbled upon because its author Patrick Weekes was involved in my favourite video game ever (Mass Effect), you would get the impression I truly loved them. Which is nice and all, but also brings high tension into the air: would Weekes be able to conclude his trilogy as well as he started it? And since I get the feeling the first book was not meant to stand as part one of a trilogy, but was rather recruited into the trilogy later, does Weekes even stand a chance? The Paladin Caper starts off immediately in the vein of its predecessors. That is, high octane action revolving between the numerous round characters that make this series stand apart, with each character moving from one near death experience to the next only to be rescued through some highly improbable turn of events. Sounds good, but… It was too much of the same, and frankly not enough octanes to rekindle the love given the already high octane stakes we had before. Plot wise, affairs continue from more or less straight from episode 2. Back then we had Loch and her gang save the Republic and the Empire from the mutual annihilation that the ancients tried to trigger; this time around the ancients are trying to take over the world in a more conventional way. That is, more conventional by the terms of a magical world: they try to take over individuals using paladin bands. These bands are sold off to people at excessive prices and promise to make people’s lives easier by offering calendar and map services. Yes, you got it right: the ancients are trying to take over the world by offering it Apple like overpriced gadgets. Only that these products come with more than your regular Google tracking; they really do let the device take over its owner. Note this opens the backdoor for an extra dose of good characters turning evil and seemingly evil characters turning out to be goodies or redeeming themselves. But I’ll shut up now; suffice to say all my favourite characters are back, Tern, Hessler, Icy, Desidora, the unicorn, the magic hammer, Loch, everyone else I managed to forget, and my personal favourite – Kail. And this time around he’s joined by his mother! 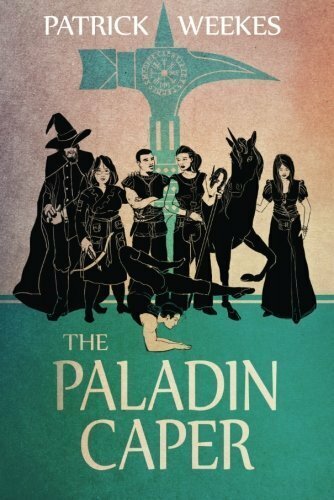 The way I saw it, given the slight misfires at the start, The Paladin Caper could only redeem itself by taking its large collection of round characters and significantly developing them further while also throwing in tons of that good old Weekes political observations/criticism that made the previous two books stand out from the bulk of the swords & sorcery fantasy genre. I am therefore ecstatic to say that, against all odds (seriously, how can Weekes repeat this again and again? ), The Paladin Caper manages to achieve that and then some. It might misfire at the start, but it sure turns into a great book! Political insight deals with more than the mindless zombies our smartphones are turning us to be or the NSA grade trackers they act as. There is plenty of veiled criticism towards the way the media is controlling us and shapes our world views on matters such as terrorism, with crosshairs set firmly on the likes of Fox News. Taking things further, there are plenty of things for the reader to ponder through the analogies between the Urujar in the book (who happen to include the heroes Loch and Kale) and their real world equivalents in blacks and Muslims. Add it all up, and you have yourself the conclusion of a trilogy featuring lots of characters you learn to love like they were your family members through a series of books advocating liberal values, gender and racial equality. All of which is happening in a very high action, fast paced setting. In other words, we have ourselves a Mass Effect series of books. To say that Patrick Weekes “did it” is an understatement. The Paladin Caper is the third successful book in the series and highly deserves 4 out of 5 crabs. Way more importantly, though, is the fact the whole trilogy of books provided such great, insightful entertainment. Usually, by the time I finish a trilogy, I thank The Goddess for rescuing me from the clutches of a big time drainer. With Weekes’ trilogy, though, I came out plotting ways in which to influence the writer to come up with further sequels (in case you are unaware, Patrick Weekes is very open to feedback on Twitter). A world as well crafted as Mass Effect’s would be wasted if there were to be no more sequels. The same applies to this trilogy, which – as a whole – truly deserves 5 out of 5 Commander Shepard grade crabs.